Monday started with a bit of a delay. The delay of opening keynote speaker Evegny Morozov to be precise. But that wasn’t a problem for the MFW team, just a switch in the program and we were back on track. 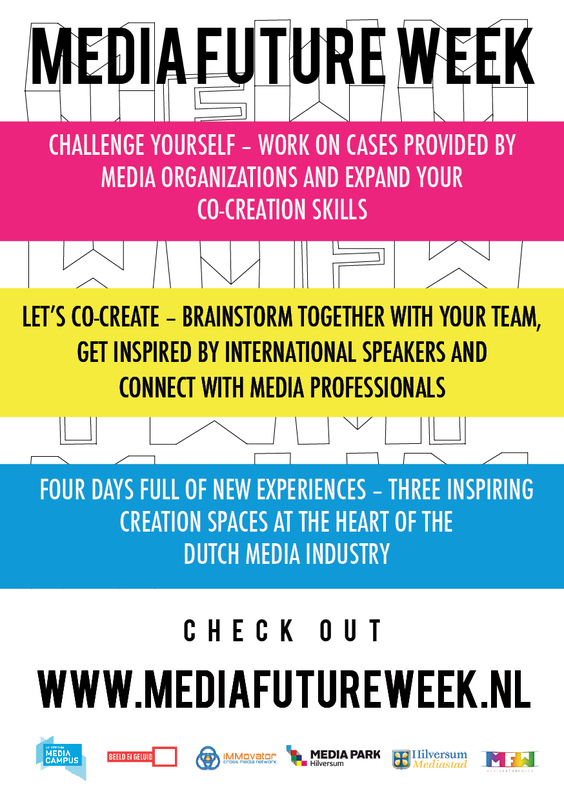 After the kick-off of the Media Future Week 2017, the teams got together and met their facilitator and each other for the first time. A bit weary but all excited the teams went to the third and fourth floor of the Mediacentre to gently set the first steps into cocreation. Some teams even decided to have a lunch break in the sun. A perfect moment to get to know each other. Not at ten o’clock as planned but strictly at two, Evgeny Morozov started his presentation. A peak into the dark side of the web. And if we have to believe Morozov the dark side is taking over. People are not realising what power companies as Google, Facebook, Amazon and Netflix have with their big data. Eventually they have the power to make people lose their jobs. Read the full report here. In the afternoon, the participants got split up. Some stayed in and got a workshop by Pieter Paul Verheggen, CEO Motivaction (An independent research and consultancy bureau in the Netherlands), presented 5 different segments in society (worldwide) and their relations to brands, media, life but also post-truth. With this information the teams, coached by Pieter Paul Verheggen & Manon Mostert – van der Sar, created a stakeholder analysis. The others went to NEP, BNNVARA and NTR. Getting a tour of the premises and more insides of their ideas about the media future. Joris Luyendijk who was scheduled to do the evening keynote changed his plans because according to his vision keynotes are boring and an interview is much more interesting. So, Monique got on the podium with Luyendijk and interviewed him together with all the participants. Luyendijk gave the participants the advice to go with the pinball that’s life and see where it ends up (read the full report here). For now it’s at the Mediacentre, working hard and having fun.